Are You Going to Bear Your Testimony? The early pioneers lived long ago. What can I learn from them? Teens from the island of Cebu in the Philippines tell about receiving answers to their prayers. Of the tens of thousands of islands on the earth, a cluster of 7,107 of them makes up the island nation of the Philippines in Southeast Asia. A running witticism common in the Philippines notes that while there are 7,107 islands, that’s only during low tide. The number of islands actually drops to 7,100 at high tide, when some are submerged below the ocean’s surface. So how do the young women and young men of the Philippines keep their heads above water when they’re feeling overwhelmed? They turn to Heavenly Father in prayer. There are times in our lives when we may feel alone, but if we remember that our Heavenly Father is always there for us﻿—always ready to hear and answer our prayers﻿—we can lean on that fact and feel the hope and confidence that knowledge brings. Joselito B. tells about being assigned to take part in a storytelling contest when he was 12 years old. His teacher asked him to memorize a 10-page script that he would have to perform in front of hundreds of other students and faculty. This can be a daunting task for anyone, let alone for Joselito, who usually gets stage fright. Joselito was nervous. But he worked hard for an entire week memorizing the script. And he prayed a lot every day. Finally the day of the contest arrived. As a young boy growing up in an active Latter-day Saint family, Ken G. had never had much trouble keeping his standards high. But when he started high school, things became harder and Ken sometimes felt isolated from the good influence of his family﻿—especially at school. Ken says the most important thing he learned from this experience is that “prayer is a sign of your humility, because you admit to yourself that you are weak and that only God can help you become strong” (see D&C 112:10). But when she got to the first store, she found that the price of charcoal had gone up from 5 pesos to 20 pesos. “I was hesitant to buy it,” Tania says, “but I could feel the Holy Ghost whispering to me to buy it anyway, so I did. Now I had only 20 pesos left, but I still had many things to buy, including diapers for my brother and clean water to drink. So I went to the next store to buy food for our meal, and it was too expensive. I reached into my pocket where I put the 20 pesos, and there were five 20-peso bills in the roll. I started crying right in front of the store owner. While we can be certain that our Heavenly Father hears and answers our prayers, we need to remember that our prayers are not always answered immediately and not always in the way we want them to be answered. Our prayers are answered according to God’s will and timing. Each of these teens from the Philippine island of Cebu has learned that in good times and bad, when we’re in a crowd or all alone, whether it’s high tide or low, our Heavenly Father is always there for us. And if we turn to Him in sincere prayer, He is always ready to bless us. To see a video of Tania’s story (in English, Portuguese, and Spanish), visit youth.lds.org and look for the video “Pure and Simple Faith” in Youth Theme, 2012. President Thomas S. Monson, “Stand in Holy Places,” Liahona and Ensign, Nov. 2011, 84. 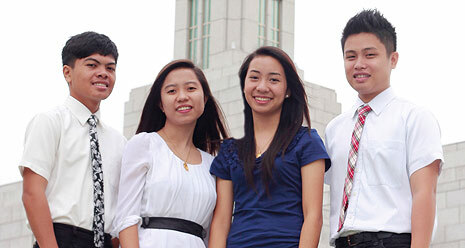 From left: Joselito, Joahnna, Rosa, and Ken gather in front of the Cebu City Philippines Temple.